How will the Enterprise Library be used with LINQ to SQL? Or does this new technology remove that layer of abstraction? This looks pretty nice but I have some problems with SPROCs. Let's say that we have some optional parameters with default values different than NULL. Linq generated methods pass NULL's that override default values, so the procedure doesn't work correctly. The third problem I encountered is that when a procedure has a return value different than zero. In this case Linq takes this return value as recordset. then I rebuilded my program by vs2008 beta2 target to .net framework3.0 too,Now the program cann't run at the vista machine with .net framework3.0 , What can i do to update .Net Framework3.0 to sp1 in other machine? or must i install the .net framework3.5? Can LINQ for SQL return/handle multiple tables? So if a SPROC returns 2 tables how would iterate across them both? Is there a way to generate the database schema from objects using code? Most demos that I have seen create the context class from databases that already exist. 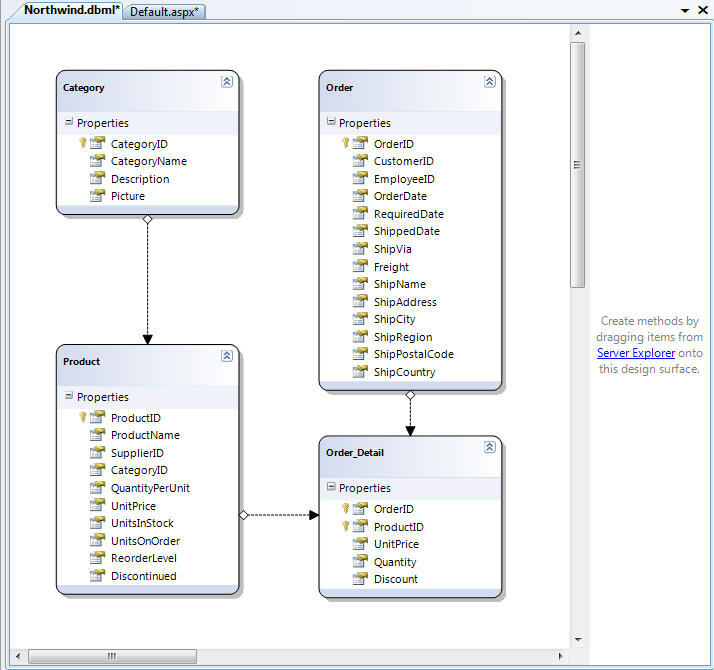 NHibernate allows you to create the objects and xml mapping files before creating the database. Once you are happy with your object structure you can call NHibernate.Tool.hbm2ddl to create the database. This creates all the tables with the appropriate relationships. If there is no such functionality are there plans to implement it. 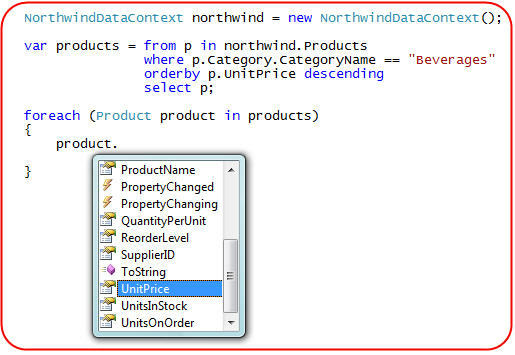 Brilliant, looks like many 3rd party ORM mappers will be obsolete with Linq. This was the tutorial I've been waiting for! I'm really glad to see support for out variables and multiple result shapes. Unfortunately for me I lie on the "procs only" side of the debate, as I've never worked with a DBA who would allow ad-hoc SQL queries. So, I'm wondering if there is a way to use the object-mapping and stored proc features of LINQ, but to turn off the ability to run ad-hoc SQL? I've been investigating this since the last beta but haven't found a way. I also haven't seen any way to specify a default select command, in the same way you can specify default update/insert/delete statements. I also remember hearing some talk of a difference between "Linq to SQL" and "Link to entities", with someone saying that linq to entities would allow for more advanced scenarios, like possibly creating a stored-proc-only query model. Do you know if these technologies are now one in the same? >>>>>> How will the Enterprise Library be used with LINQ to SQL? Or does this new technology remove that layer of abstraction? I'm pretty sure there will be an update of the Enterprise Library to take advantage of all the new .NET 3.5 features (including new ones like LINQ). I don't know the exact ETA for it - but I believe the PAG team is working on this now. Scott, all these things look amazing, I have a question though. Performance wise you really don't gain anything by using LINQ (website -> DB), as compared with writing efficient SQL and a DataAccess code. What do you say are the biggest benefits of LINQ? Basically, why do you think people should/would choose to use LINQ, and what business/performance/product gains are received when moving to LINQ? >>>>>>> Let's say that we have some optional parameters with default values different than NULL. Linq generated methods pass NULL's that override default values, so the procedure doesn't work correctly. Second problem is that mappings are bad when columns in a SPROC's select are written as [Field] (with square brackets). The third problem I encountered is that when a procedure has a return value different than zero. In this case Linq takes this return value as recordset. Can you send me email with a description of these issues? I can then loop you in with the LINQ to SQL team to have them investigate. >>>>>>> then I rebuilded my program by vs2008 beta2 target to .net framework3.0 too,Now the program cann't run at the vista machine with .net framework3.0 , What can i do to update .Net Framework3.0 to sp1 in other machine? or must i install the .net framework3.5? Can you provide more details about your WPF application to me in email (scottgu@microsoft.com). I can then have someone investigate why you are seeing a multi-targeting issue. >>>>>>> Can LINQ for SQL return/handle multiple tables? So if a SPROC returns 2 tables how would iterate across them both? Yes - LINQ to SQL can support this as well. Basically you'd use the same approach that I demonstrated with the IMultipleResult sample above. If your SPROC returned two results sequentially then you'd just call GetResult twice in order to retrieve the sequences. >>>>>>> Is there a way to generate the database schema from objects using code? Most demos that I have seen create the context class from databases that already exist. NHibernate allows you to create the objects and xml mapping files before creating the database. Once you are happy with your object structure you can call NHibernate.Tool.hbm2ddl to create the database. This creates all the tables with the appropriate relationships. Yes - the option to create schema based on the object model (as opposed to creating the object model based on the schema) is also supported with LINQ to SQL. 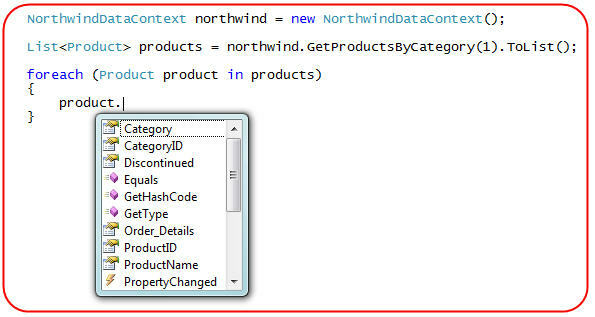 The DataContext class has a "CreateDatabase()" method that you can programmatically call to create the database schema for an application based on your LINQ to SQL object model. Just set the connection-string of the DataContext to point to your database, call CreateDatabase() and you should be set. I don't believe LINQ to SQL can directly call SPROCs that dynamically build SQL on the fly - except maybe by calling the low-level ExecuteCommand() method that the DataContext exposes that allows you to override the SQL executed. 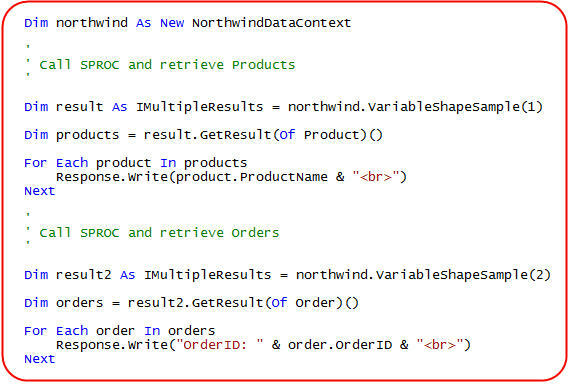 You can, though, definitely handle dynamic query scenarios using dynamic SQL using LINQ query expressions you write (which might be what you are asking for above). I have it on my list of things to cover in a blog post in the future. >>>>>> What do you say are the biggest benefits of LINQ? Basically, why do you think people should/would choose to use LINQ, and what business/performance/product gains are received when moving to LINQ? I think the biggest benefit of LINQ to SQL is that it provides a good way to cleanly structure your data model in an object oriented way. The ability to define data model classes that can be independent of the underlying database schema gives you much more agility as you build your application (since you can change the underlying column names without having to update your code). And the ability to cleanly integrate model-level validation and business logic rules helps avoid you writing duplicate logic in multiple places. Just like to say I had been waiting for LINQ to SQL quite eagerly since DLINQ previews last year, but now it's here I'm not sure about it. It makes for great demos where all the SQL is hidden away and all that. I looked into how I could add application level security into the datacontext - so that the datacontext knows how to restrict queries based on the user. 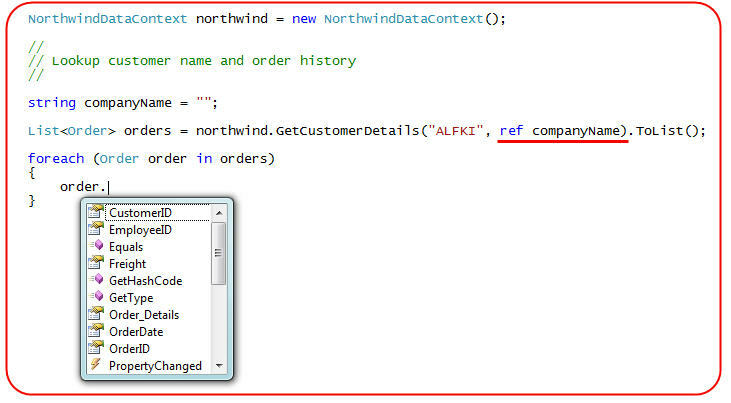 For example i want to restrict the current user on northwind to customerID='ALFKI' (and related tables, e.g. orders), and if that user tried to modify a url e.g. CustomerID=AROUT he'd get no data. The upshot of discussion on MSDN forums is that there is no extensibility to the datacontext class that might be usable in this way. So the conclusion I am reaching with Beta2 is that LINQ to SQL is a nice feature for your excellent demos Scott, but unusable for a serious application. These posts are awesome, that you so much for the time and effort you put into this stuff; it makes picking things up at a trot so much easier. I was wondering if you had thought of providing selections of your blogs as PDF docs for download, so that we could have, for example, this LINQ series of posts all together in one place in chronological order. I understand this thread is about SProcs, but I have questions unrelated to SProcs (if you don't mind). a) As a DataContext (DC)become a container for my tables, will there be any event handling in the designer to handle events (i.e. OnNewRecord, OnUpdateRecord, BeforeDeleteRecord) that relate to each tables in the DC? b) When it comes to performance and connection time, does it matter the how many tables exist in a DC? c) Is it better to have less DCs with more tables in them or is it better to have more DCs with less tables in them? Tell me please, is there a way to use SqlDependency with SPROCs & LINQ scenarios? Slightly off topic (although still LINQ to SQL related); is there a way to use LINQ to retrieve hierarchical data? For example, if I have a table that references back to itself through multiple levels (such as would normally be displayed in a treeview), how could I retrieve this using a LINQ query that would get to all levels? I am guessing that the answer would lie in datashaping; I can do it using a recursive query in SQL2005, but alas I have no idea where to start on this one within LINQ! I'm looking forward to your posts on Linq To Entities, especially to find out what the actual differences are between the two ORMs. Linq To Sql seems to have grown up a lot since it's original conception. 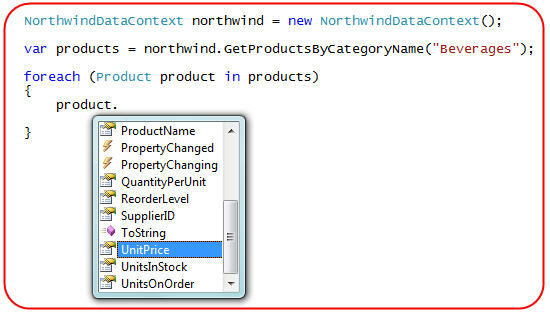 I'm wondering if Linq To Entities will have anything more to offer (other than not being MS Sql only). I have the same question as Martin Robins. 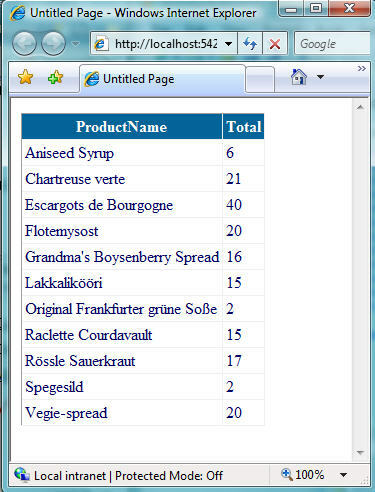 In SQL 2005 we had support for a kind of hierarchical query. Is there somethign in Link that'll let us pull out a whole tree efficiently? eg. without selecting every record and without running a query for every row to get its children, but result in a tree? >>>>>> I was wondering if you had thought of providing selections of your blogs as PDF docs for download, so that we could have, for example, this LINQ series of posts all together in one place in chronological order. I've actually been thinking about doing something like this. After I make more progress over the next few weeks with a few more posts I'll look into enabling this. >>>>>>> a) As a DataContext (DC)become a container for my tables, will there be any event handling in the designer to handle events (i.e. OnNewRecord, OnUpdateRecord, BeforeDeleteRecord) that relate to each tables in the DC? I'd recommend looking at my part 4 segment on updating. It shows how to handle a bunch of partial methods that enable events both before and after a column is updated, and before additions/edits/deletes are made. >>>>>>> b) When it comes to performance and connection time, does it matter the how many tables exist in a DC? I don't think the number of tables makes any difference from a performance perspective. >>>>>> c) Is it better to have less DCs with more tables in them or is it better to have more DCs with less tables in them? I think you want to group tables based on whether they are related - that is the high order bit to optimize for. If you have a single database with tables that have associations between them, you probably want a single DC. If you have multiple databases then you'd want multiple DataContexts. 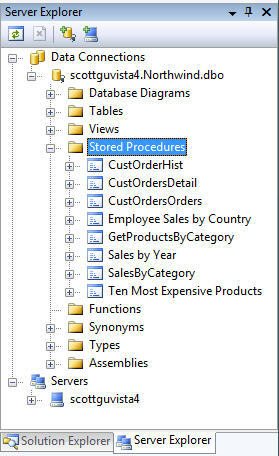 Looking forward to seeing how the data modification statements (update/delete/insert) are handled with LINQ! >>>>>> Tell me please, is there a way to use SqlDependency with SPROCs & LINQ scenarios? I need to investigate this more in the weeks ahead and figure out how to enable this. >>>>>> For example, if I have a table that references back to itself through multiple levels (such as would normally be displayed in a treeview), how could I retrieve this using a LINQ query that would get to all levels? You can have entities that have relationships with themselves (for example: Employee that references its manager and reports). One of the things I need to put together a sample of is one that shows how best to retrieve this hiearchical data (without doing a separate query for each employee). if the record match the query condition exist, it works well, but if the record doesn't exist, it will throw an exception, but when I query something, I don't know if the record exist, and I don't think exception is a resonable way. so how to know whether the record exist or not? How I can get StoreProcedure's ReturnValue? Is there any benchmark which has compared the performance of using LINQ queries expressions and LINQ SPROC? >>>>> Great post (as usual). I'm running into a wall trying to substitute stored procedures for dynamic T-SQL in a DataContext that serves as the data source for a LinqDataSource control, which would enable editing of a bound GridView or DetailsView. 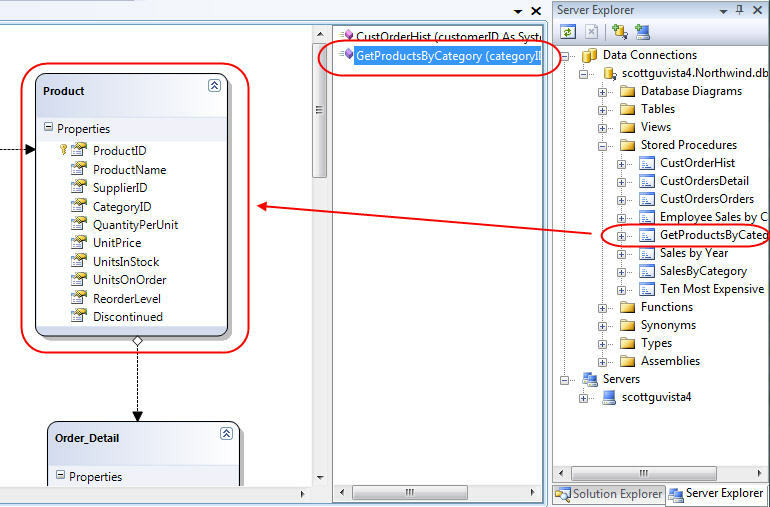 ISingleResult implements IEnumerable but not Table, which is required for the EntityClass to be visible in the Data Source Wizard's second dialog. Is there a solution (other than moving to the ObjectDataSource) that isn't a hack? Any chance you could send me an email (scottgu@microsoft.com) with a quick sample that demonstrates what you are trying to-do here? If the object you are trying to edit is a Table on the DataContext, then I think you can handle this scenario by handling the Selecting event on the LinqDataSource. Alternatively, the cleanest way might be to use the ObjecytDataSource. >>>>>> if the record match the query condition exist, it works well, but if the record doesn't exist, it will throw an exception, but when I query something, I don't know if the record exist, and I don't think exception is a resonable way. so how to know whether the record exist or not? If no product matches the query then it will return null. You can then check for this to detect whether the record exists or not. >>>>>> Hi Scott, Is there any benchmark which has compared the performance of using LINQ queries expressions and LINQ SPROC? >>>>>> How I can get StoreProcedure's ReturnValue? Is it possible to provide an example of how LINQ would work with a query which returns multiple tables (from joins). As often data is a lot more than just a single table. As always, great post as part of a great series. My question is about the timing of the data load. With a regular LINQ to SQL expression, the expression tree is built in the app, then when you iterate or call ToList() or the like is when the SQL script is actually fired in the db, right? I assume then, that the same is the case for a sproc call, so you create an object that maps to the expression calling the sproc, and then when you evaluate that object through iteration or other inspection is when the sproc actually fires. Intuitively, the logical answer seems to be that since Sprocs (in the db) do not return table-valued objects, that the sproc has to execute and send its result to the app, and then the app would evaluate it in the second expression much like if it were a Linq to Objects expression. Is that correct? I blogged a bit about my thoughts on it if that's the case, as well as my approach to the sproc vs. dynamic query question (my answer is Views for selects, sprocs for CUD), but I wanted to see if my intuition is correct or not. Is it possible to create managed CLR stored procedures in C# using LINQ, rather than writing the stored procedures in SQL? Sometimes, I'd like the code to execute on the database, but still would like to use LINQ to write the code. >>>>>> Is it possible to create managed CLR stored procedures in C# using LINQ, rather than writing the stored procedures in SQL? Sometimes, I'd like the code to execute on the database, but still would like to use LINQ to write the code. 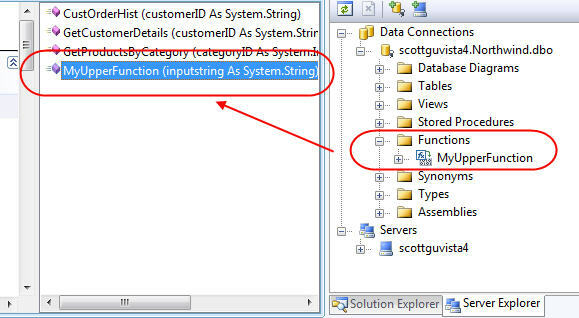 Yes - you can created SPROCs using managed code now - which would also then allow you to use LINQ to SQL to invoke them. VS 2005 has the support for creating managed SPROCS too. >>>>>> Is it possible to provide an example of how LINQ would work with a query which returns multiple tables (from joins). As often data is a lot more than just a single table. What are the plans for handling updates to the Result object returned from a SP where the Result is from an underlying join? Are there Insert, Update, Delete methods on the Result object that can be pointed back to SPs that can handle this? Hi Scott, love this series. The data objects created are not marked [Serializable], so binary formatting (and thus use with SQL server session state) is impossible on the objects this returns. Even if I manually change the generated cs file, the EntitySets are sealed and not serializable. Is there a workaround or will they be fully binary-formattable in the release version? Until then, looks like we might have to just save to the non-session database? Where is the connection string stored when we use LINQ to SQL. How can we change the connection string. this has been a great series. Just one thing seems to be missing. How do we dispose of the DataContext class that we create for the SQL database? For example, the NorthwindDataContext class is an IDisposable object, but if I actually call Dispose on it then I get ObjectDisposed exceptions when I access the data that came from that NorthwindDataContext. Doesn't that leave huge amounts of resources open if I've made many calls to my database? Cool! Now tell me, i see that you can drop a particular sp on a particular class in the designer, but what if someone drops a SP on to a wrong class, let's say someone drops the a CusOrderHistory on to the Order class instead of Product in the designer. shouldn't there be any validation , that will use some sort of reflection to validate design-time. If an SP executes a dynamic query and returns rows from a table, can I explicitly map the result of the SP to an object? Moreover, if an SP returns fields from different tables by inner joining them in a dynamic SQL, how can I map it to proper object? Regarding your second question, I would guess that as long as the designer can match column names and data types in the result set to fields in your object then you should be able to apply the mapping. Mehfuz & Omar> By default, your sprocs return types will be something custom based on the fields it returns, regardless of the underlying data source. 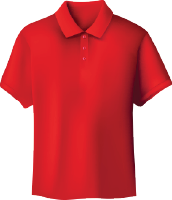 If you want them to be able to reference another existing object, you can add an association. In the case where you accidentally try and drop a sproc on the 'wrong' object, one that it cannot properly cast the results to, you'll get an error from the designer that the schemas don't match. I recently installed Beta2 and finally started playing with lambdas in VB. Please tell me why these same line of code comile to very different IL and return different results in VB and C#. Can we be sure that this would be fixed before release? Could you please show us an example where you have a stored Procedure similar to the following, how to extract the value returned. >>>>>>> Where is the connection string stored when we use LINQ to SQL. How can we change the connection string. 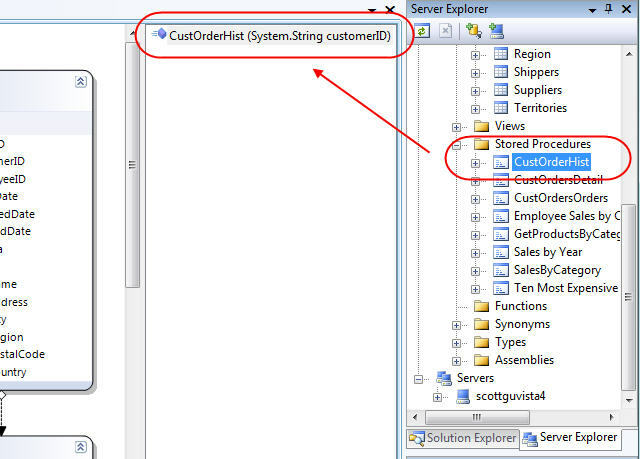 By default the LINQ to SQL designer stores and retrieves the connection-string from the application's web.config file. If you want to programmatically override this, you can pass a connection-string as an argument to the constructor of the Datacontext object. >>>>>>> What are the plans for handling updates to the Result object returned from a SP where the Result is from an underlying join? Are there Insert, Update, Delete methods on the Result object that can be pointed back to SPs that can handle this? You can create a new Data Model object whose values are populated as the result of an underlying Join. You could then use SPROCs for the update/insert/delete scenario to re-shred the values into separate tables. >>>>>> this has been a great series. Just one thing seems to be missing. How do we dispose of the DataContext class that we create for the SQL database? For example, the NorthwindDataContext class is an IDisposable object, but if I actually call Dispose on it then I get ObjectDisposed exceptions when I access the data that came from that NorthwindDataContext. Doesn't that leave huge amounts of resources open if I've made many calls to my database? The Datacontext object actually doesn't hold open any connections to the database - so you don't have to explictly dispose of it. Instead, it retrieves new connections from the connection pool only when it needs them, and then returns them as soon as it is done. >>>>>> Cool! Now tell me, i see that you can drop a particular sp on a particular class in the designer, but what if someone drops a SP on to a wrong class, let's say someone drops the a CusOrderHistory on to the Order class instead of Product in the designer. shouldn't there be any validation , that will use some sort of reflection to validate design-time. 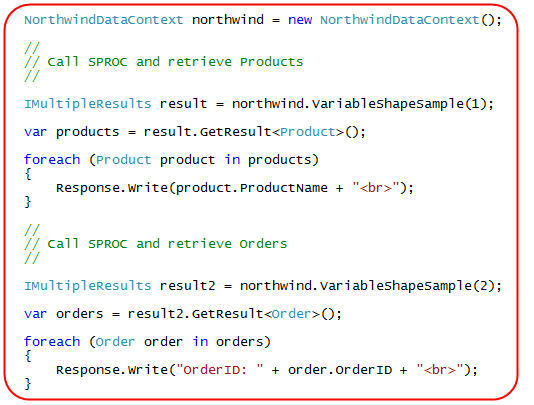 If you try and drop a SP on a data model class whose shape doesn't match the output of the SPROC, then the designer will automatically raise a "schema doesn't match" error. >>>>>> If an SP executes a dynamic query and returns rows from a table, can I explicitly map the result of the SP to an object? Moreover, if an SP returns fields from different tables by inner joining them in a dynamic SQL, how can I map it to proper object? Yes - you can map the return of an SP to a different object - even one composed from a JOIN from multiple tables. >>>>> It makes for great demos where all the SQL is hidden away and all that. I looked into how I could add application level security into the datacontext - so that the datacontext knows how to restrict queries based on the user. 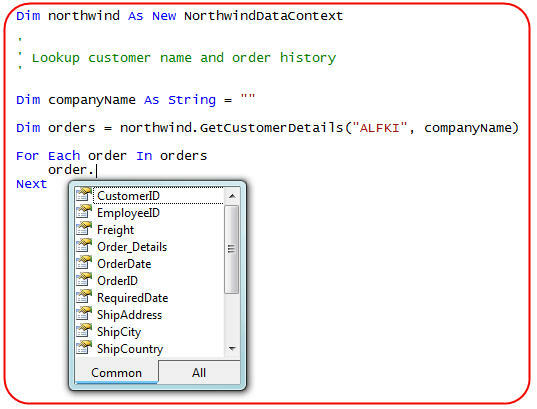 For example i want to restrict the current user on northwind to customerID='ALFKI' (and related tables, e.g. orders), and if that user tried to modify a url e.g. CustomerID=AROUT he'd get no data. The DataContext class allows you to customize default Load() methods for each entity you define in your data model. This provides the ability for you to insert custom security logic to implement a security policy check should you want. This pattern allows you to fully secure access from anyone trying to retrieve the data. can i use linq in order to create user defined objects as SP, triggers etc in managed code for sql server ? i can use any linq code for creating SP, triggers, user-defined methods, compile everything and deploy in sql server ? does the sql server clr has accsess to linq in the bcl ? is there any link to guide me how its done ? I don't know if anyone else has tried, but calling stored procedures for types that use InheritanceMapping doesn't work. "Object not set to an instance of an object" (or whatever). I'm attempting to fake a wide table for InheritanceMapping by using joins in the stored procedure. If anyone has managed to get this to work I'd be interested in hearing what modifications were needed. My current workaround is to use a view instead of a table or stored procedure. >>>>>>>> I don't know if anyone else has tried, but calling stored procedures for types that use InheritanceMapping doesn't work. "Object not set to an instance of an object" (or whatever). I'm attempting to fake a wide table for InheritanceMapping by using joins in the stored procedure. If anyone has managed to get this to work I'd be interested in hearing what modifications were needed. My current workaround is to use a view instead of a table or stored procedure. I use IMultiResult to get two results from two tables in one sp and bind them to two dgvs. I found if I use var categories = result.GetResult(), and then dataGridView1.DataSource = categories, there'll be an exception. But if I use .ToList() after the method GetResult(), it successful. Why? I know that the LINQ to SQL is lazy-execute but I think if I use .DataSource = categories, it'll be executed. The function is not recognized. Also the intellisense is not showing the function? When I drop a table it is no problem and I can easly make the query? Is this a bug or do I something wrong?